If you’ve ever explored the greenhouse at Brooklyn Children’s Museum, you may have spotted our most elusive creatures, the walking sticks. Then again, they’re easy to miss! These bugs are masters of camouflage, and their bizarre traits don’t stop there. We delved into the strange world of stick and leaf mimics in our “Phantastic Phasmids” program and here are a few surprising facts we learned about the order of insects Phasmatodea . Most phasmids are females, and if a male mate is not readily available , the females have the ability to produce clones, an animal phenomenon called parthenogenesis. They lay hundreds of eggs containing exact female replicas of themselves! Stick bugs share a special mutualistic relationship with ants. Ants love to feed their \ larvae the special nutrient-rich part of a seed called the elaiosome. After they’ve fed their young, they dispose of the seed in an environment perfect for germination. The stick bug eggs mimic the look of a seed, complete with a fatty cap like a seed’s elaiosome. By imitating the crux of the mutualistic relationship between ants and seeds, the stick bug gains a safe anthill home for its eggs to hatch and thrive while the ants still benefit from the nutrients of that expendable knob on the stick bug’s egg. What an opportunist — the phasmid piggy-backs on an already beautifully established mutually beneficial relationship between plants and ants! And get this — when the egg first hatches inside the anthill, it even resembles an ant! The stick bug ant-mimic crawls out of the anthill to its safe habitat in the trees. Our visitors love having these alien creatures walk across their hands. Sometimes their uncanny resemblance to sticks doesn’t really strike the kids until they’re able to get an up-close view of their long branchy legs. 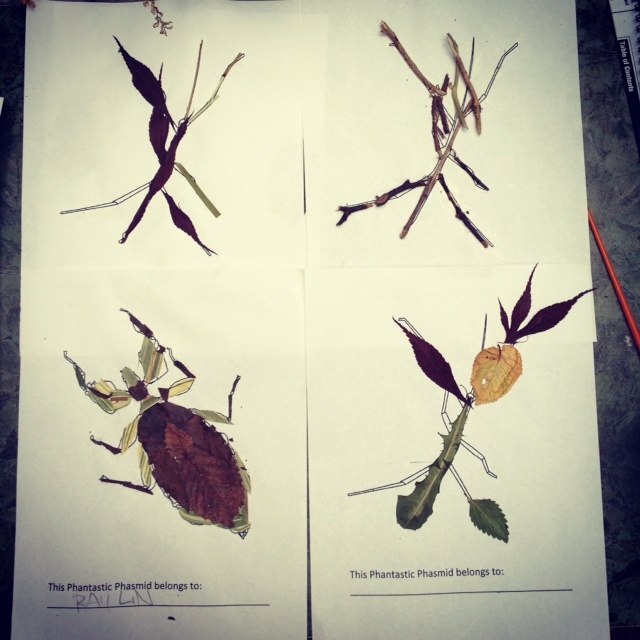 One fun activity to try with your students is to make a phasmid collage. Have the kids go outside and collect a few sticks and leaves that have fallen from trees or other plants. When you get back to the classroom, use glue to compose a phasmid that would remain expertly hidden from any predators seeking a buggy snack. We used these leaf and stick bug templates to get the kids started with their collages. Email us at gogreen [at] brooklynkids.org if you would like a copy of these templates for your classroom. 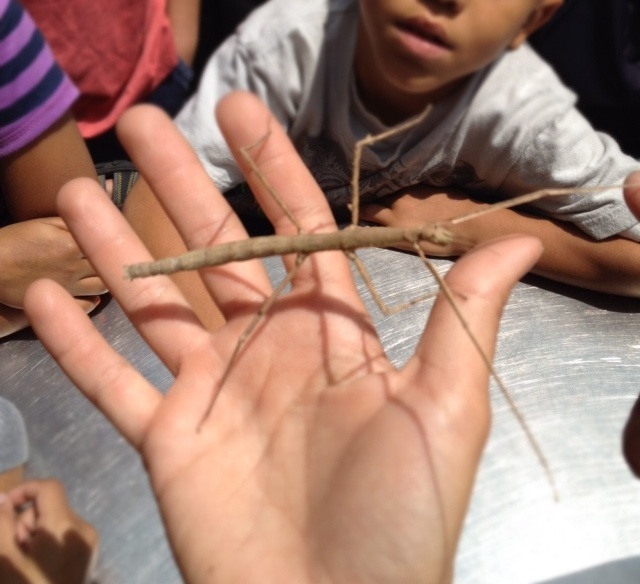 Learn more about phasmids and see some cool walking stick videos at our sister blog Brooklyn Greenhouse. Did you know that the largest snake in New York lives at the Brooklyn Children’s Museum? Fantasia, a 245 lbs albino Burmese python, is always on view to the public in our Science Inquiry Center. Unless someone is hiding a mammoth snake in their bathtub (not a good idea! ), Fantasia is the biggest! There’s no more visceral way to introduce students to the concept of predation than to visit during a Fantasia Feeding Frenzy. Every other Thursday, crowds gather to see Fantasia presented with her prey on long forceps. Her tongue starts to flick, picking up the scent of her recently deceased food, and then she strikes! Check out this video of Fantasia striking at a chicken. Of course, captive Fantasia doesn’t really have to do the work of preying on her food, but she quickly coils her constricting body over the chicken nonetheless. She’s overcome with the instinct to quickly hide and protect her food from any other potential predators looking to steal it away. Their lack of arms and legs make snakes fairly vulnerable during meal time. This video shows Fantasia taking the final gulp of a four guinea pig meal. You can really spot her unhinged jaw and strong neck muscles pulling her furry treat down her trachea. Though Fantasia’s size makes her seem like she’s at the very top of the food chain, she’s really far from it. In the wild, Fantasia’s bright yellow color would have probably made her prey to a predatory bird or other beast as a small snake. Try this fun outdoor Predator vs. Prey game with your kids. One or two kids are assigned to be the predators. They are essentially “it”. Remind kids that there are always fewer predator animals in the wild since they’re at the top of the food chain and require the most energy! Assign the rest of the kids to be prey. Have them stand inside several hula hoops bases spread out on the ground where they are safely hidden from predators and can’t be tagged. Prey animals must leave their hula hoops to collect food — at least three items! Gather some props to stand in for the prey animal’s food sources — some paper leaves or plastic bugs like these would be perfect! Each round will last a few minutes and the prey that collects three food items without being “consumed” by predators wins! Some of the most memorable experiences we offer at The Brooklyn Children’s Museum involve adventures with our live animals. There are daily opportunities for kids to feel the scales of a snake, see a sea star extend its bright tubular feet, or let a delicate walking stick move across their outstretched hands. We’d like to introduce you to some of the animals that make teaching at the museum such a thrill. 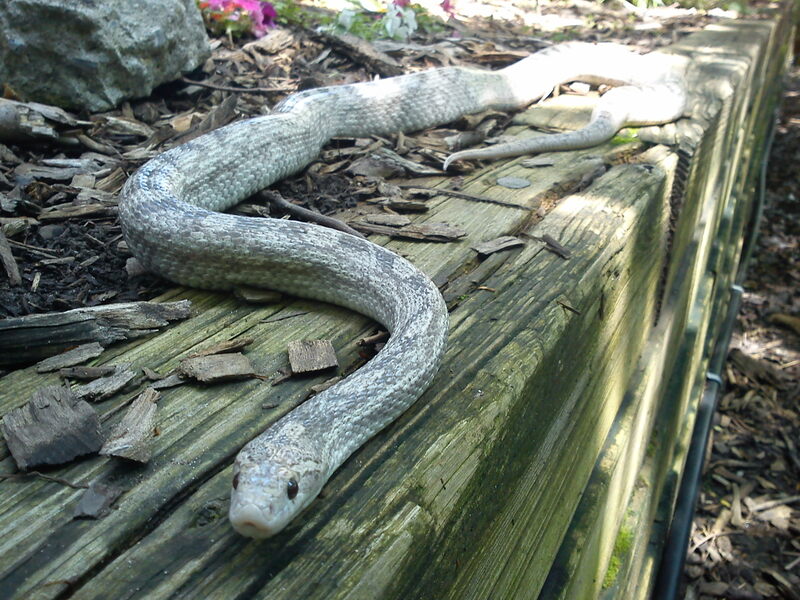 Indigo, an albino corn snake, is native to North America. 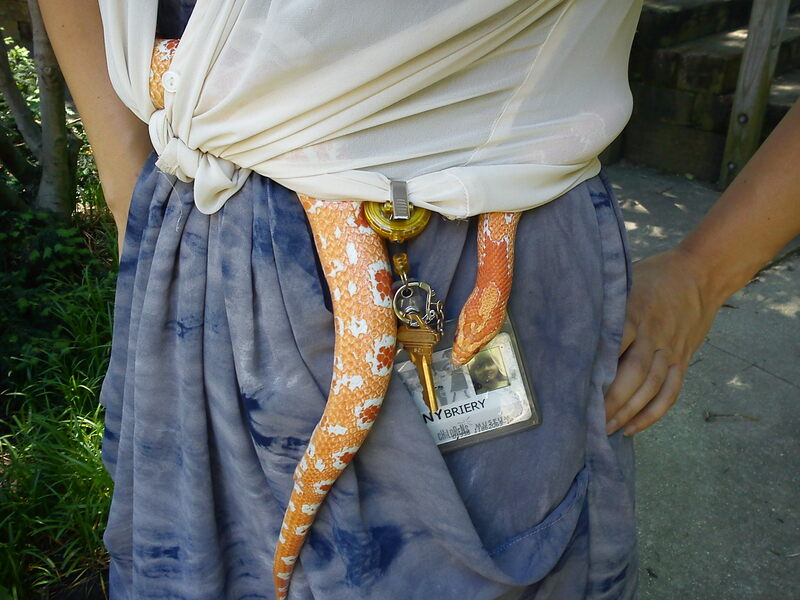 Corn snakes are found in the southeastern and central states. Their name comes from a propensity to hang around corn silos in search of small rodents, their favorite meal. Corn snakes are constrictors, meaning they kill or subdue their prey by squeezing before swallowing them whole in one big gulp. Indigo’s beautiful “ghost morph” pattern and Dots’ “fluorescent orange” color comes from selective breeding, a deliberate mishmash of dominant and recessive pigment genes. 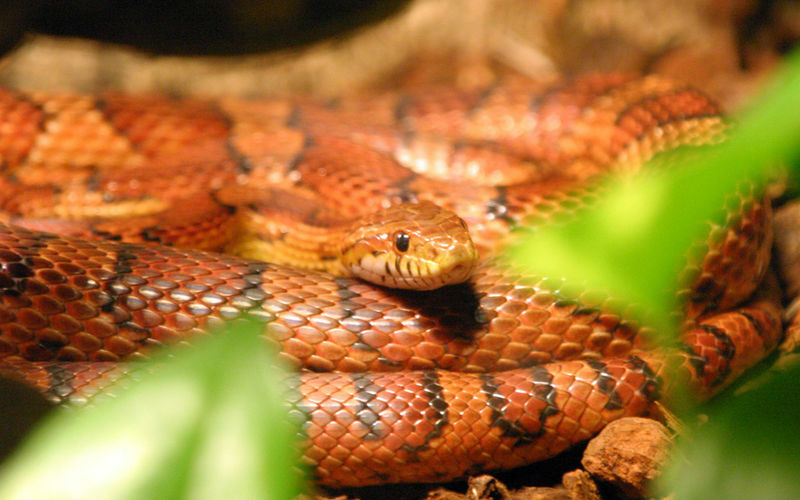 The standard pattern of a corn snake is a beautiful blotchy brownish-orange that blends well into shaded forest leaf litter. Indigo’s light blue-grey color and Dots’ vibrant orange would have made it difficult to camouflage in the wild. They would probably have been eaten as young snakes by a predatory bird. We’re so glad they’re with us! 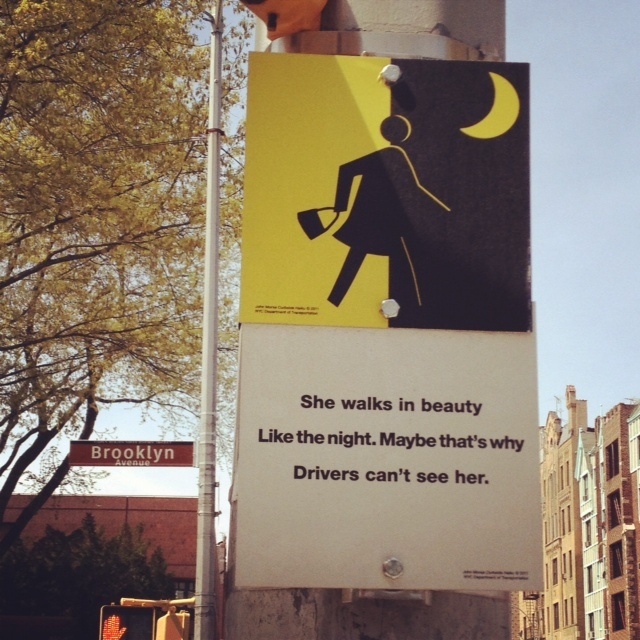 Have you spotted any of the haiku traffic signs that have been placed around the city’s five boroughs? The next time you visit the Brooklyn Children’s Museum, check out the sign on our corner – Brooklyn Ave and St. Marks. 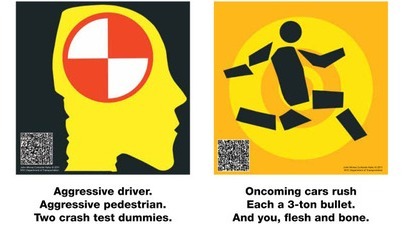 The New York City Department of Transportation collaborated with artist John Morse in this creative project to get people to think twice about their fragile skin and bones before making any rash moves on our busy city streets. This project ties together social and environmental aspects of sustainability. One of the biggest disincentives to commuting via bike is the risk of injury. Swerving around parked cars, avoiding car doors, and riding inches from speeding vehicles are all part of the daily life of a bike commuter, but biking in the city also leads to cleaner air and healthier urbanites. These cautionary words and images aim to lower the safety risks by reminding pedestrians, cyclists and drivers to wake up and slow down. Plus, they add some poetry to our street corners and art can be just as important as clean air in creating a vibrant, sustainable community. Haikus are a great introductory form of poetry for first-time poets. Have kids clap out the syllables of these signs and see if they can figure out the haiku form for themselves. Challenge them to write their own “green street” haiku. What do they want to see on the city streets and can they express it in 17 syllables? We’d love to hear the haikus they come up with! 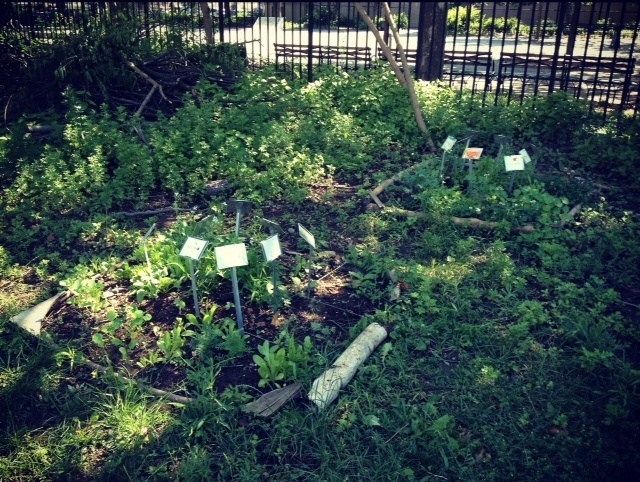 With all the alternating rain and sunshine we’ve been getting, the Kids Crew gardens are taking off! 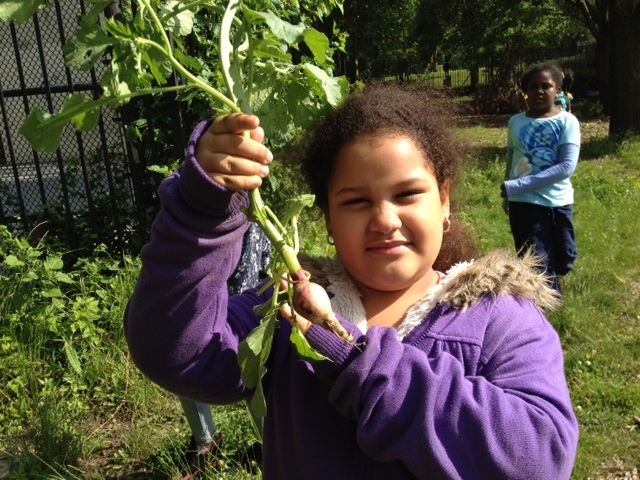 Yesterday, some of our gardeners were able to harvest their first vegetables! 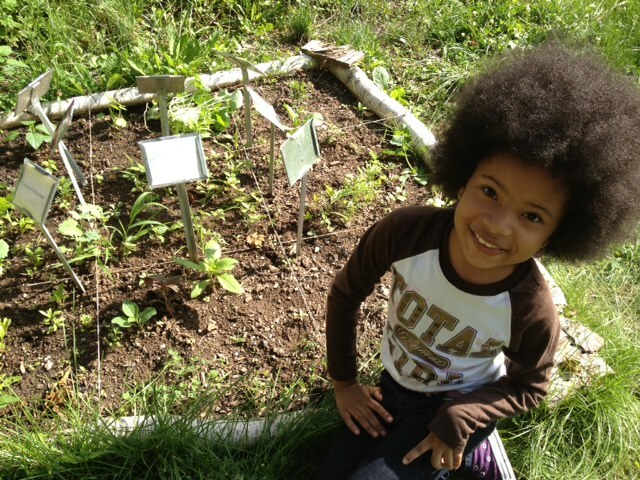 Emily had the biggest bounty with three radishes in her garden plot. She kept one for herself and generously doled out the rest to friends. 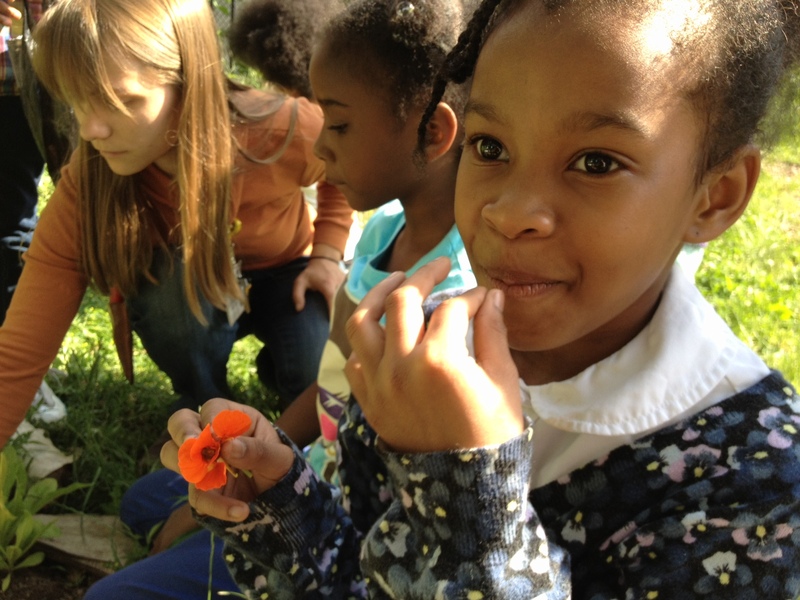 Aliana had the first blooming flower, an edible nasturtium. Without hesitation, she picked the flower and gave it a taste. Delicious! Soon there was a crowd of curious co-gardeners begging for a petal. Other students taste tested their spinach, kale, and other lettuces. Lots were super excited to reap the fruits (or veggies) of their labor. Last week, we introduced you to our “It’s Easy Being Green” program with the Farm to Table card game. Students also play another exciting green game in this program, a recycling relay race. New York City produces 14 million tons of waste and recyclables every year and nearly half of that gets recycled. We can do better! PlaNYC’s goal is for us to divert 75% of our trash from landfills by 2030. Every household, business, and school in the city is required to recycle by law. The city usually picks up recycling once a week from your curb. You can look up your pick-up day here. Now, it’s just time to sort…an activity that isn’t always as intuitive as you’d think. For our recycling challenge, we split kids into two teams and give each team three bins: Paper & Cardboard/ Glass, Metal & Plastic/Trash. Each group gets a bag full of mixed (clean) trash and recyclables. 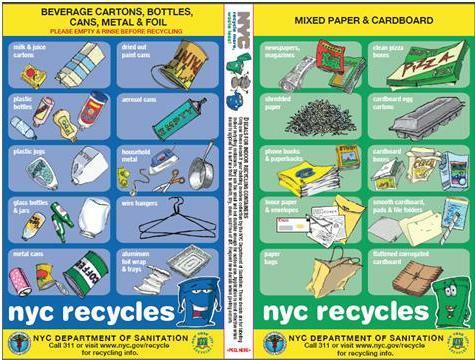 Each child in the group studies the NYC handy dandy recycling fridge magnet and then sorts one waste item into a bin. To make this activity more exciting, each student must wait until the previous student places their item and returns to their seat before they can place their own item in the proper bin. The two teams race to the finish, but of course, it’s a race of accuracy rather than speed. We then go through each bin item by item. If an opposing team thinks an item has been placed incorrectly, they can hold up a hand and say “I Object!”. We talk through the discrepancy and make sure the item makes it to the proper bin. Are you recycling savvy? Take our little quiz to find out! Q 1: Where would you put a yogurt container? Yogurt containers can’t be recycled- only 1 & 2 plastic bottles and jugs can be recycled. What if it has a 1 or 2 on it but isn’t a bottle or jug? Nope, won’t work. The plastic in 1 & 2 take-out containers, soup containers, or cups can’t be melted down with 1 & 2 bottles & jugs. Tricky stuff! Read more on plastics here. Q2: Does it matter if your recyclables are gunky? Yes! Rinse your items before you throw them in the bin. If your recyclables are too gunky, the may be considered “contaminated” and not recycled. Q3: Do you have to put your recyclables in a clear bag, won’t a black bag do? 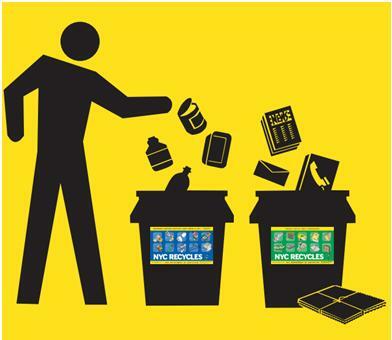 When you place your recyclables on the curb, they need to be in a clear plastic bag OR tossed in a bin labeled with an NYC Recycling sticker (but no black bags) . Fill out this form to request recycling decals for your bins. Q4: Can lids be recycled? Recycle metal lids, but toss the plastic ones. If you ever have a question about any item, NYC WasteLess has an awesome search bar. Enter any item, and it’ll tell you how to dispose of it properly.